If a recent Frost & Sullivan survey of more than 1,000 IT decision-makers is any indication, desk phones are eventually headed the way of typewriters. Half of the respondents have already deployed softphones to provide telephony and unified communications services over desktop computers and mobile devices. Softphones boost responsiveness, which yields greater productivity and satisfaction. Vendors — including Avaya, Cisco Systems, IBM, Lifesize, Microsoft and ShoreTel — offer softphone clients that tightly integrate with enterprise PBX systems. Many Voice over IP service providers also offer softphone clients. 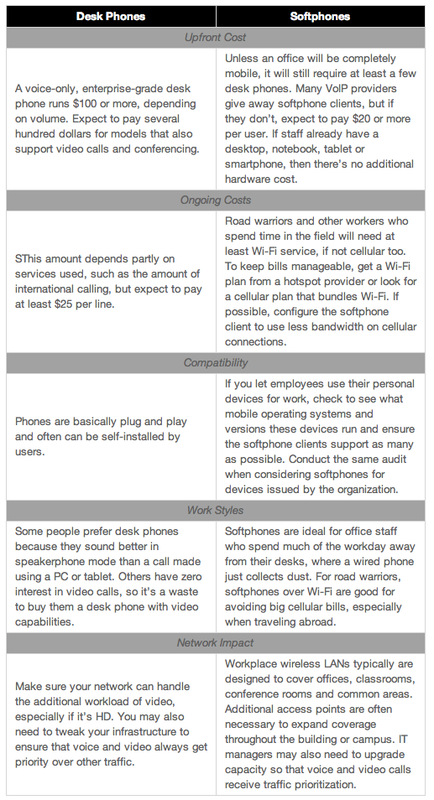 The following chart can help IT managers decide whether or how to replace desk phones with softphones and weigh the most important variables.